The Province of Bohol continues its trailblazing efforts in development. CY 2006 stood witness to yet another meaningful stride we have taken towards the attainment of our tall vision of building a greater Bohol. 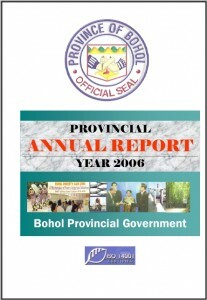 The CY 2006 Annual Report of the Provincial Government of Bohol shows a good runthrough of how the Province fared in the preceeding year, most especially in the sectors of Social Development, Economic Development, Development Administration, Infrastructure Development and Environment Management. As development is primarily anchored on the strength of the community, our Provincial Government forged significant partnership with different social agencies and invested on various social development programs and projects. This is highlighted by the multi-million comibined grant and local counterpart for the implementaion of the flagship poverty-alleviation KALAHI-CIDDS:KKB Projects, which benefited thousands of households in 12 component municipalities. While encouraging self-reliance and independence among its communities, the Province of Bohol continues making the most of its two main economic drivers – toursim and agriculture. The earnest efforts of the Provincial Government in bringing domestic agriculture productivity to a higher scale are stamped in various initiatives like the Bohol Rice Project, the introduction of new farming technology to the local farmers through the Farmers Information and Technology Services (FITS) centers, agri-entrepreneurship promotion, agricultural researches in partnership with the Bohol Agricultural Promotion Center (BAPC), high-volume coconut production, and continued implementation of the Comprehensive Agrairian Reform Program (CARP), among others. The local tourism industry, likewise, continues to flourish with the consistent and aggressive efforts of the tourism stakeholders and key players. We have enjoyed a good increase in tourist influx last year, which was squarely met by our local hotel and resort entreprenuers through the equal expansion of their establishments and services. The tourism industry is strongly supported by the vastly improving investment climate of the Province. This can be attributed to the marked competence of the Bohol Investment and promotions Center (BIPC) in its challenging task of drawing investors to our Province. As our main economic drivers are relentless in their grind, our local income is also buoyed by efficient tax collection. Various activities and innovative schemes were mapped out and implemented to intensify and strengthen the revenues generation program of the Province. Likewise, to further improve services, the Provincial Government of Bohol has kept pace with office technology application with the installation of the e-NGAS, which fully automated the accounting system of the Provincial Accountant’s Office, Provincial Budget Office, Provincial Treasurer’s Office and the Provincial General Services Office. Of course, to conduct us smoothly to progress, we gave focus to our infrastructure development projects, the biggest of which is the Bohol Circumferential Road Improvement Project (BCRIP) that largely upgraded our primary road network. We now have good highways to complement the image of our Province of Bohol as a top tourist destination in the country. Our irrigation facilities are also being looked after so as to adequately meet the demands of our farming sector. Even as we enjoy significant developmetn in those areas, we have not put behind our responsibility to our environment. On the contrary, it has remained as one of the top priorities of the Provincial Government. Although lack of funds hindered the implementation of some vital environmental initiatives, much still had been done in the preceding year to ensure ecological balance – protected areas management, socio-economic, bilogical and underwater assessment, waste management, reforestation, and other programs of the like. These accomplishments spell a significant rise of Bohol our of the pit of poverty. Indeed, we are now very far from our old post of the Club 20 poorest provinces in the country. Yet, these achievements are just but a fraction of the things that need to get done ahead of achieving our grand vision. We still have a very long way to go. Thus, the Governor is calling for and counting on the continued dynamic complementation not only of the leaders and stakeholders but also of the whole Boholano community as we advance further to progress.